To say that I’m excited to tell you about this product is an understatement. 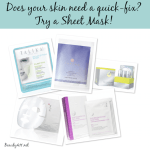 I’ve tested similar treatment masks from SK-II (review) and LaMer (review) and love them. They work amazingly well; the problem is, they’re expensive. 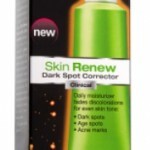 The Garnier Skin Renew Dark Spot Treatment Mask has really impressed me and even better, is only a fraction of the price! 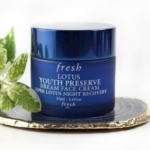 To use, unwrap a Skin Renew Dark Spot Treatment Mask and apply to clean, dry, skin. It takes a little repositioning to get the mask to fit the contours of your face. Leave the mask on for 10 minutes, then remove and massage the remaining product into your skin. Each unscented facial mask contains Vitamin C to increase cellular turnover and boost radiance, plus ½ bottle of hydrating serum with glycerin in it for added moisture and glow. 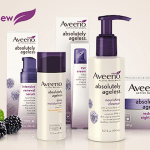 With those two ingredients alone, you can expect to see improvement in dark spots, dullness and uneven skin tone. I’ve already done several of the Skin Renew Dark Spot Treatment Masks and love the way my skin feels—hydrated, fresh looking and renewed. I didn’t experience any irritation or burning with this product at any time; however, if you have sensitive skin, it’s always best to do a patch test before use. If your skin is dull, dehydrated and/or has dark spots, these masks are worth a try. 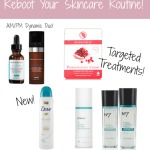 I do plan to re-purchase and use the Skin Renew Dark Spot Treatment Masks when I travel; they would also be great to use before a night out. 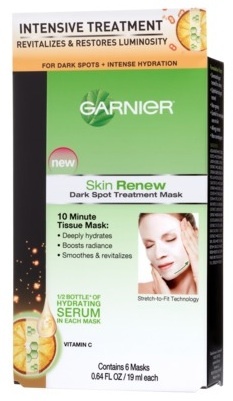 Garnier Skin Renew Dark Spot Treatment Masks come 6 to a box, with a suggested retail price of $16.99. Look for them at drug and discount stores and online at Target.com. 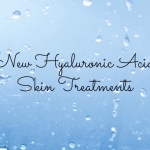 Have you ever tried this type of facial mask before?